Deep Sky West Remote Observatory (DSW) is a remote astrophotography observatory complex situated on Rowe Mesa in Rowe, New Mexico. This 35-acre high altitude site (elevation 7,400 feet) offers pristine dark skies, excellent seeing, and weather conditions coveted by all imagers. The complex was developed to make remote imaging and hosting affordable for the “average” backyard astrophotographer. DSW’s “Alpha” facility is the first of several ”roll-off building” observatories (“ROBO”) and is designed and operated specifically with the backyard astrophotographer in mind. 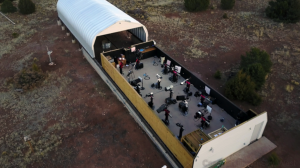 The facility offers professional, state-of-the-art, affordable and convenient astrophotography environment to allow anyone to host to host their own telescope, join an existing team, or become a member of a team on DSW’s equipment. Deep Sky West’s target audience is the average backyard astrophotographer who has a love for the hobby (and usually has great equipment) but is plagued by poor skies. The lack of consistently clear skies results in equipment going idle for long stretches. When the weather does cooperate, many imagers must travel far to remote locations, set up equipment from scratch, polar align, image, and tear it all down again at the end of the session. Imagers fortunate enough to have a home observatory don’t have the hassles of setting up and tearing down for each session, but most locations lack quality skies. DSW is designed to change all this. By offering access to consistently clear skies and consistently great seeing, your equipment investment does not go to waste. DSW was built with industry standard instrumentation and safety features and is organized in a way that makes its service surprisingly affordable. DSW provides imagers with great skies regardless of where they live. Its current members include dedicated imagers from Australia, Austria, Brazil, China, England, Germany, Israel, Italy, New Zealand, Switzerland, California, Georgia, North Carolina, Minnesota, Michigan, New Mexico, Tennessee, Texas, and Virginia. 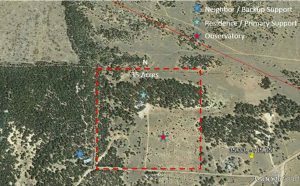 The DSW remote observatory is located near Rowe, New Mexico (35.32N latitude, 105.72W longitude), at an elevation of 7400 feet. Albuquerque, population 555,000, is roughly 54 miles west southwest, and Santa Fe, population 69,000, is about 27 miles to its northwest. SQM range at the observatory is >=21.7 and seeing ranges from 1.0 to 2.0 arc seconds, although 0.8 has been observed. The existing observatory building measures 25 by 60 feet. 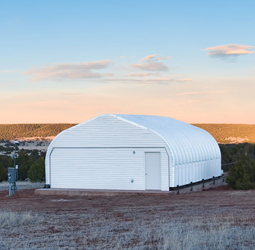 The structure is a corrugated Steel Master A-Model Quonset hut. The entire structure rolls away to expose the enclosed telescopes to the sky with horizon-to-horizon coverage down to at least 25 degrees. The inner stem walls provide protection from ground-level wind when the building is rolled away. The structure is engineered to withstand snow and wind loads associated with the local conditions. All equipment is insured, and each member hosting equipment is also required to carry insurance. Premiums vary, but are generally less than $300 per year. If you need assistance, DSW can refer you to an insurance broker to assess your needs. Each of the 18 isolated imaging locations are on 7- by 7-foot squares with custom-built, 0.25-inch thick-walled, cold-rolled steel piers available. The piers have a flat top surface with universal tapped holes to fit Software Bisque and Astro-Physics mounts. Other mount brands can be accommodated, as well. The observatory is serviced by 100-Mbps fiber Internet connectivity, both up and down. Instrumentation and controls include: M10OASYS automation and control, Interactive Astronomy’s SkyAlert Cloud Sensor for primary rain sensing, a Hydreon Optical Rain Sensor for secondary sensing, a Hunter Rain-Clik for tertiary rain sensing, Interactive Astronomy’s SkyEye all-sky camera, a Unihedron Sky Quality Meter, Bosch and custom low-lux surveillance cameras, and Cisco Meraki cloud-managed network infrastructure. 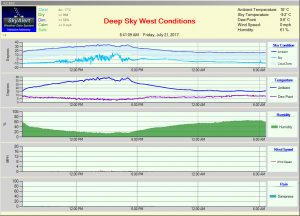 The site’s current telemetry can be accessed at http://deepskywest.com/telemetry/ . DSW promotes teamwork. Many of its active imagers are actually members of “imaging teams.” An imaging team can be formed around your system, or you can join a team using a system owned by another DSW member. If you decide to build an imaging team around your own system (although it’s not required), DSW has proven out a few best practices, including (1) share all data facilitated through a cloud storage service; (2) vote on target selection; (3) select one member as the primary system operator familiar with automated imaging programs (i.e., CCDAP, ACP, etc. ); and (4) final images are property of the processor. Join an existing team for as low as $50US per month. This is the easiest way to get involved and only requires you to find a team looking for members. DSW helps facilitate this process, as needed. Its website promotes team formation by allowing prospective members to post the equipment they’d be willing to install at DSW. Interested members with complimentary equipment, or in some cases no equipment at all, can post and apply to be a part of a team. Some teams will be as small as two members. The maximum is seven. DSW’s experience has taught that the sweet spot ranges between three and seven members, considering such factors as agreement on target selection, image-integration requirements, image-quality requirements, etc. DSW staff currently operate five “in house” systems that have limited availability. These presently include five options: (1) a 14.5-inch RC Optical with an SBIG STX-16803 plus adaptive optics on a Paramount ME for $2400 per year; (2) an Astro-Physics RH-305 with an FLI ML8300 on a Paramount ME for $1800 per year; (3) another Astro-Physics Rh-305 with an SBIG STX-16803 on an A-P 1600 for $2000 per year; (4) a Rokinon 135-mm f/2.8 ultra-wide field with a QSI583sw on a Paramount ME for $600 per year; and (5) an FSQ106 with a QSI683wsg-8 on a Paramount MyT for $1200 per year. To put those prices in perspective, remember that you get all imaging data, you participate in image selection, and DSW images every clear night. Anyone with suitable equipment can join DSW as an individual, or start an imaging team. This involves finding a core group of imagers who together have, or can acquire, a complete imaging system. For example, one DSW imaging team utilizes a TEC 160 owned by a member/founder from Texas joined by team members from Italy and China. This team shares the lease costs, and all data is shared equally amongst the imaging team members. DSW personnel are available to perform system installations if you can’t make the journey and do it yourself. It charges a nominal fee for set up and testing. The process typically requires two or three clear nights to complete, including the physical installation, network set up, polar alignment, and calibrations as required (focuser, PEC, rotator, collimation, etc.). If you perform your own installation, DSW personnel will be on site to assist you. Oh, and DSW provides on-site lodging free of charge! The basic hosting fee is $8400US per year. This fee includes electricity, network, support and site insurance. Members who form full teams of seven effectively pay $100 per month per person (although team financial arrangements are up to the team). This demonstrates one of DSW’s key principles: Remote imaging can be affordable – so much so that some of its imagers choose to be members of more than one team. For more information, visit http://deepskywest.com/.